There are a lot of bloggers out there. One of my favorites is Shim Marom of the Quantum Leap blog. Co-incidentally last month I moved to Melbourne where Shim works. We met for coffee and talked blogging and project management. What a pair of nerds, eh? Anyway, we got to talking about doing some sort of collaborative project where we produce something. Probably related to projects and blogging. We met again today and matured the idea a little. Let me share some of our thoughts and if you are interested in collaborating feel free to get in touch. To start with I grabbed a white board marker and started drawing boxes randomly in the hope that a good idea might fortuitously land in one. Shim interrupted me and asked me what it is we are trying to achieve. A great question of course and one that is asked far to infrequently. 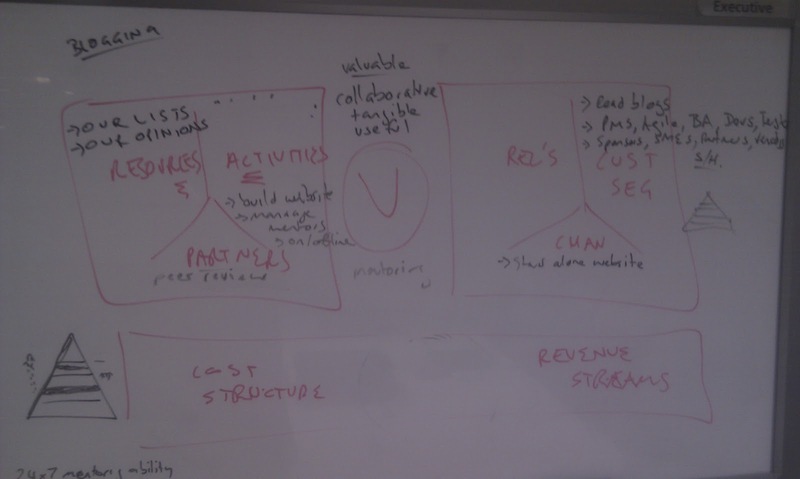 My response was to sketch up the Business Model Canvas and after a brief explanation we got started on brainstorming our business model. 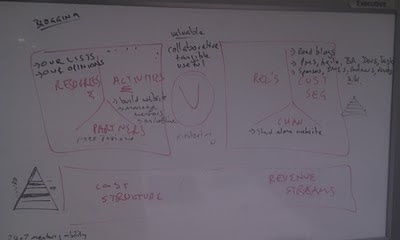 If we start with the theme of blogging, we begin with the question of what value we want to extract from the project. Since we are both well paid middle class guys money isn't top of the list so we talked about achievement and contribution as our measure of success. The next question; Who is our customer? Well, you are actually. But maybe that's not quite right. We then went into a side conversation about who reads what blogs. We talked about the change in focus on this blog over the years from the basics to more advanced stuff, and how some readers have come along on the journey at more or less the same rate, while others have dropped off or lost interest as they either advance more quickly or slowly. Some people just move out of projects and others find alternate communities to get their reading fix. Still in control of the white board marker I drew up the triangle diagram indicating the various levels of knowledge and the relationship to audience size. (Kind of like this) So we reckon that PM Hut has a naturally larger audience that this one for example, as it focuses on more entry level content. So that means the platform for the solution can't be this blog or Quantum Leap. Our channel will have to be a stand alone website or something already serving this diverse audience. That also helps focus us on the core things we have that we can share; knowledge about how projects work, but also knowledge about who else knows stuff you (and the other readers) want to know. And that got us focused on the ideas of bloggers as mentors. That's a theme we are going to follow for now. 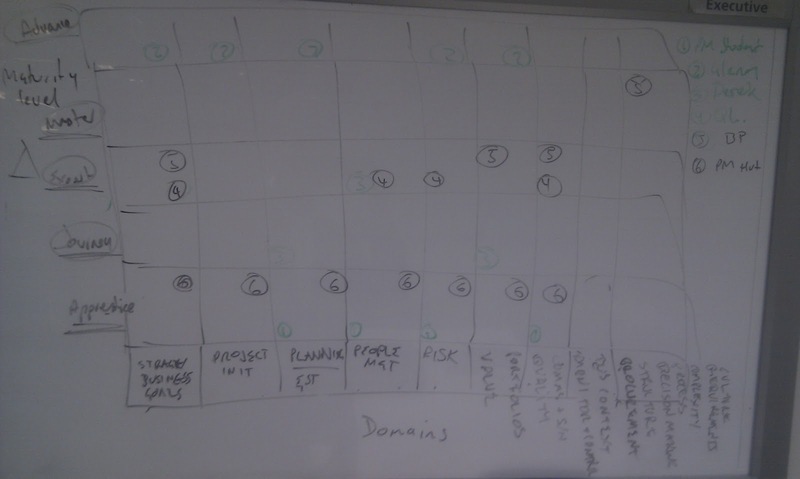 Imagine bloggers on project management for a moment. It's a fair assumption most of them would volunteer some time to help others in a mentor capacity. Imagine if we could connect their wisdom with the unwashed masses of newly indoctrinated project workers. Surely that would be a contribution to the community for all of us. So, summing up; Our first goal is to create a reference table of PM blogs and somehow match their writing level to audience reading needs, and also to tag each blogger with a set of 'content attributes' like the tags bloggers put on posts. Once we have the model we'll publish it to you guys and start to populate it with what we think is right for the bloggers we know. You can help then also by nominating blogs you know or write and offering the right categorization for them. And if you're a blogger and would volunteer to be in the list; do get in touch. Oh yeah - And think about it! Great summary mate. 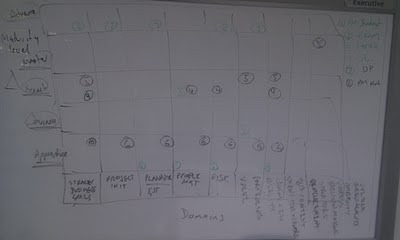 My version of reality is here: http://quantmleap.com/blog/2010/12/project-management-blogs-what-are-we-really-here-for/. I can't wait to see what you guys cook up! Many of my posts come directly from questions I receive, and I normally answer them directly and also discuss the topic on the blog to benefit the whole audience or people who might search on the same question in the future. I wonder if what Soma is doing aligns with your goals? Perhaps an opportunity for collaboration there. Count me in of course! At pmStudent.com I focus on helping new and aspiring project managers with their project management careers, learning project management best practices, and gaining project management experience. @Josh - thanks for the reminder about Soma. And thanks for volunteering. @Grand_Poobah yep. Got your number buddy. Count me in, too. My blog, The Practicing IT Project Manager, is half news summary, half "best practices" articles. Each Sunday, I post a list of articles from the previous week that are worth reading (including some from Better Projects.net) and most weeks I post something driven by a question or issue at work. As a manager of project managers, I have no shortage of either questions or issues. Great post thanks a lot!!!! Shim, I just read the article you linked to in your post. Great stuff. I would have posted a comment there but I am using a t-hub and it doesn't render the site properly.